This one pan, 30 minute meal is perfect for a weeknight dinner. A flavorful dish for a weeknight meal. 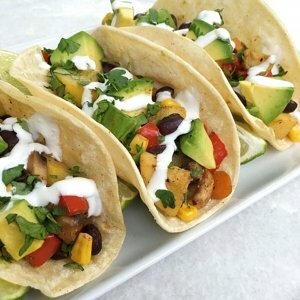 One pan Veggie Tacos for a weeknight win! Red pepper, carrots, mushrooms, squash, black beans and corn all sautéed in a Mexican spice blend and topped with avocado, cilantro and a sour cream-lime drizzle. Less than 30 minutes prep and super yummy! Red pepper, carrots, mushrooms, squash, black beans and corn all sautéed in a Mexican spice blend and topped with avocado, cilantro and a sour cream-lime drizzle. Less than 30 minutes prep and super yummy! Add squash, mushrooms, beans and corn. Mix ½ cup sour cream & 1-2 tbsp of lime juice sour cream drizzle.